Last chance: We only have 186 left - This product will not be available again once our stock runs out. Now Your Poker Game is Really on a Roll! Add a Dicey Twist to a Classic Game! 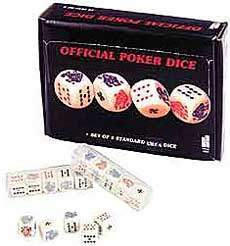 A set of five standard, engraved, Poker dice in a plastic storage case. Die face includes: King, Queen, Jack, Ten (10), Nine (9) and Club. The face of each dice also has the letters that are used on deck of french cards. Buy 1 for $1.98Buy 2 / Save $0.11!Buy 3 / Save $0.40! Size (inches): 3.62" X 1.10" X 1.10"
Product was as described and it arrived quickly ! I'm sure my girls will put them to use ! Thanks, ZooScape !! !